The meaning of the second Lenormand card, Clover, is luck. Clover Lenormand Card In The Grand Tableau. Clover in Rider position: Lucky news. Clover in Clover position: Extra lucky. Clover in Ship position: Lucky travel. Clover in House position: A lucky home. Clover in Tree position: Luck in health. Clover in Clouds position: Luck in an area you know little about. Clover in Snake position: Luck in deception. Clover in Coffin position: Lucky endings. Clover in Bouquet position: Luck brings happiness. Clover in Scythe position: Lucky surgery. Clover in Whip position: Luck in competition. Clover in Birds position: Lucky union. Clover in Child position: a Lucky child. Clover in Fox position: a Lucky job. Clover in Bear position: Lucky boss. Clover in Star position: Dreams coming true. Clover in Stork position: Lucky change. Clover in Dog position: Luck with friends. Clover in Tower position: Luck with authorities. Clover in Garden position: Lucky social events. Clover in Mountain position: A lucky delay. Clover in Crossroad position: Lucky decisions. Clover in Mice position: Luck is lost. Clover in Heart position: Luck in love. Clover in Ring position: Luck in marriage. A fortunate marriage. Clover in Book position. Luck in a study. Clover in Letter position: Lucky mail. Good news. Clover in Man position: A lucky man. Clover in Woman position: A lucky woman. Clover in Lily position: Lucky retirement. Clover in Sun position: Luck in achievement. Clover in Moon position: A lucky romance. Clover in Key position: Luck in success. Clover in Fish position: Luck in business. Clover in Anchor position: Luck at work. Clover in Cross position: A blessed ending. 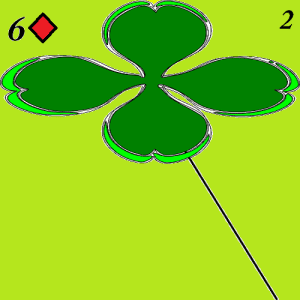 Clover in Lenormand usually means Luck and Good Fortune. Clover is one of the most positive cards to get in a reading and it denotes a happy outcome to your question.